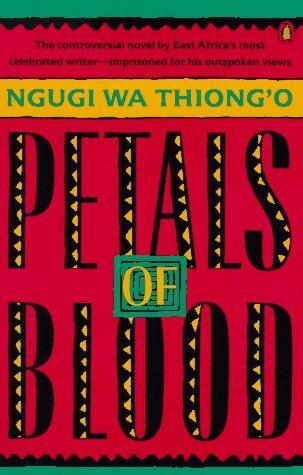 It’s probably cheating to include this 1977 novel by Kenyan author Ngugi wa Thiong’o in our international crime fiction month. It’s certainly not a book you’d be likely to find shelved in a library’s mystery section, and most of the novel is devoted to the history and politics of post-Colonial Kenya. However, a murder is what sets the novel in motion, and the solving of that murder brings it to a close. And the chapters in between are filled with what some might perceive as crimes, despite the fact that they are perfectly legal. The crime that opens the novel is the murder through arson of three powerful African businessmen. Three other men—Munira, a teacher; Abdullah, a shopkeeper; and Karega, a labor organizer—are brought in for questioning by the police. The bulk of the novel is these three men’s recollections of their long history with the murdered men. Aah, that was a time to remember, when the whole world, motivated by different reasons and expectations, waited, saying: they who showed Africa and the world the path of manliness and of black redemption, what are they going to do with the beast? They who washed the warriors’ spears in the blood of the white profiteers, of all those who had enslaved them to the ministry of the molten beast of silver and gold, what dance are they now going to dance in the arena? We could have done anything, then, because our people were behind us. But we, the leaders, chose to flirt with the molten god, a blind, deaf monster who has plagued us for hundreds of years. We reasoned; what’s wrong is the skin-colour of the people who ministered to this god; under our own care and tutelage we shall tame the monster-god and make it do our will. We forgot that it has always been deaf and blind to human woes. So we go on building the monster and it grows and waits for more, and now we are all slaves to it. Munira, Abdullah, and Karega all have good reason to be angry. They’ve seen men who claimed to be in their corner turn away again and again. Peaceful objections seem futile, and hopes are dashed repeatedly, in large and small ways. It’s clear why their thoughts might have turned to murder. Although most of the drama in the novel is related to politics and economic oppression, Ngugi also brings up the problems in the education system, which fails to teach African students their own history and remains deaf to student pleas for a more Afro-centric curriculum. There’s also the interesting case of Wanja, the woman all three suspects have loved in one fashion or another. Through her, we see the particular plight of African women. At times, the novel seems overcrowded with ideas, and the plot, with its multiple flashbacks and narrators, is not as easy to follow as it could be. However, the details of the plot seem less important than the ways the story revolves around the same central problem that manifests itself again and again. The powerful are most interested in retaining power, and once the weak become powerful, they too often fall victim to that same urge. And that’s true not just in Kenya, but all over. I’ve read several Ngugi, though not this one. Wizard of the Crow really is a crime story at heart. It’s a wonderful,rich book full of all kinds of stuff. I think he’s a writer who deserves a much wider audience. I’ll see if I can get my hands on Wizard of the Crow. I really liked the writing in this one and would happily read more. I must get back to my Africa reading now that I’m dedicated to my TBR – I have a whole shelf of books that I bought last year. Although, of course, it turns out that I don’t have any by Ngugi wa Thiong’o and this sounds really good. I’ve read a scandalously small amount of African fiction, and I want to read more. I have a couple more on my shelf–and even more on my list. Ngugi is like that. Most of his books concentrate on post-independence Kenya though Weep Not Child, The River Between and A Grain of Wheat are exceptions. He’s is concern in the life of the people. And is quick to point out how those who fought for independence were pushed aside by the elite who became a replica of the colonisers. It started at the end of A Grain of Wheat and me meet them in Matigari. Petals of Blood I’ve not read and together with Wizard of Crow is on my wishlist. His concern for the people really shone through in this book. It was heart-breaking to see the reversals, over and over again. And it’s a piece of history that isn’t taught much in the U.S., so I was glad to read this. Wizard of the Crow does sound good. Between your and CB James’s mention of it, I’ll have to look into it for sure. This sounds really interesting and well-written. I’ve not read it but do hope to some day! This is right up your alley, Amy. I think you’d really like it. I’m reading Wizard of the Crow later this year (hopefully) and I’m really intrigued with the issues you say this novel brings up. I hope I enjoy Thiong’o too. I’ll be interested to hear what you think of Wizard of the Crow. After reading this, I want to look into that one as well.